The Hyperion was the first portable PC-compatible to reach the market in 1982, a few months before the Compaq Portable. 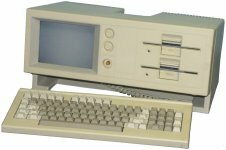 Despite this, and being significantly lighter, its compatibility was not as good and its floppy drives were unreliable and it was never as popular as the Compaq. The Hyperion is part of the equipment Dr Hanson borrows from The Firm to try and fix Airwolf, although she doesn't appear to use it.